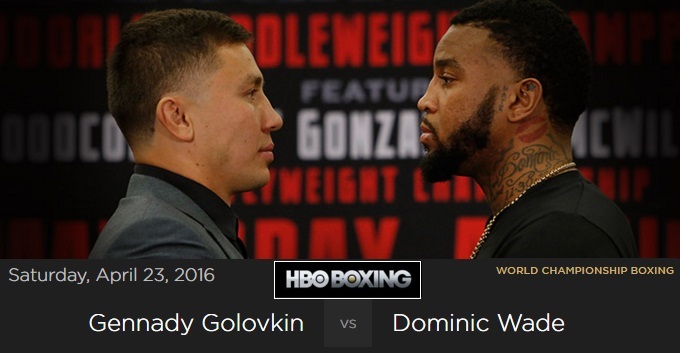 Gennady Golovkin will defend his WBA and IBF Super middleweight titles against Dominic Wade in Forum, Inglewood, California, USA this Saturday, 23 April 2016. Golovkin who is taking this fight as a stepping stone towards potential mega fight later in the year against either Canelo Alvarez or Billy Joe Saunders. But Wade is no pushover who comes into the fight with unbeaten record of 18-0-0 12 KO’s. It will be an HBO boxing championship series (non-ppv) and the fight night is scheduled to start at around 10:00 pm ET. There are couple of other quality fights on the undercard with Roman Gonzalez taking on McWilliams Arroyo for the WBC World flyweight title while Kenia Enriquez will fight Amaris Quintana in what will be the light flyweight fight. Golovkin who was in talks with Canelo camp since late last year and also Bill Joy Saunders but both fights failed to materialized forcing Golovkin to look for alternative and Dominic Wade steps in for what should be an interesting fight precisely two weeks before Canelo-Khan takes place in Last Vegas. Since it is a non-ppv event presented by HBO it will be available on regular HBO Boxing channels and will be part of “HBO Championship Boxing” series. If you are outside USA there will be number of channels broadcasting the fight live. BoxNations has the live coverage rights in the UK. Kazakhstan TV Channel will broadcast the fight in his native country “Kazakhstan” while ZDF will broadcast in Germany. Below is the schedule of Golovkin vs Wade card.